TV & FILM | Monkey Magic! The Pilgrims have started their Journey to the West! They seek the missing scrolls of Buddhist Cannon that will help bring harmony and order to the Dragon Empire. Demons know this and fear this. Not only do they attempt stop the Tripitaka, Monkey, Sandy and Pigsy in their mission to India, they run amok in the Empire itself. If they cannot stop the pilgrims they seek to reduce what they aim to save to ashes! Only the brave men and women of the Dragon Empire’s Martial Arts Circles fight back against the demonic onslaught. Each victory they win they increase the people’s hope of returning the Heavenly Order to the Universe. I’ve had numerous requests to write a Wuxia version of Monkey, where the focus of the game shifts to mortal martial arts heroes. Defenders of the Dragon Empire is that game. While Monkey and company head off to India, the mortal heroes and heroines must defend one of the Tang Empire Cities (which is detailed and becomes the focus of this game-type) from the evil army of Demons that have turned up at its gates. Its a Kickstarter stretch goal at two levels. 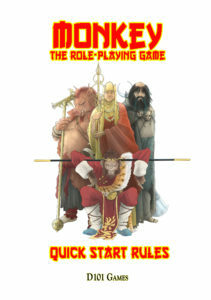 As an Early Stretch Goal where I include a chapter about how to tweak Monkey to run a mortal based game. If the Kickstarter reaches higher levels of funding, I’ll expand and develop Defenders into its own standalone game. Being mortals they are not innately magical and the emphasis shifts to amazing displays of talents with the occasional special feat being thrown into mix instead of big fights were chi-powers are thrown around casually (often along with nearby scenery) as is the case with Immortals. Flying Swords of Dragon Gate visually nails it for me about were the Kung-Fu element should be. This scene from Kung Fu Hustle shows three masters mow down hordes of extras. 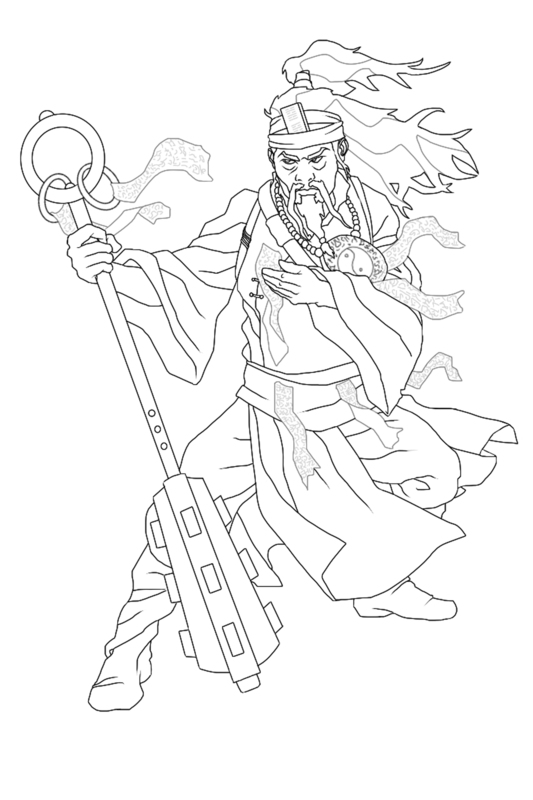 And as for Taoist Sorcerers, here’s a scene from Spooky Encounters which demonstrates a Sorcerer’s Duel. 23 Days of Monkey, Day 10 PIGSY!! Pigsy , an ex-Marshall of the Heavenly armies kicked out of the Western Heaven for er trying to mess about with one of the Queen of the Western Heaven’s Handmaidens, is the epitome of lust and greed. But he also has positive values. Despite his constant bickering with Monkey, who takes a big brother role in the group, he does genuinely care about his fellow travelers. He’s also got a great sense of humour, which makes him the focus of much comedy in the various film and TV adaptations. Here Monkey meets Pigsy in the 80s Japanese series, which is quite faithful to the book. Probably the most sinister version of Pigsy, in direct opposition to the usual daft version, is the ‘smooth faced’ pigsy in Stephen Chow’s Journey to the West Conquering Demons. This an introductory scenario for Monkey, that I’ll be including in the main rulebook if he Kickstarter funds as one of the Stretch Goals. The following is the pitch I gave when i ran it Furnace 2015 a UK convention in Sheffield held during October. 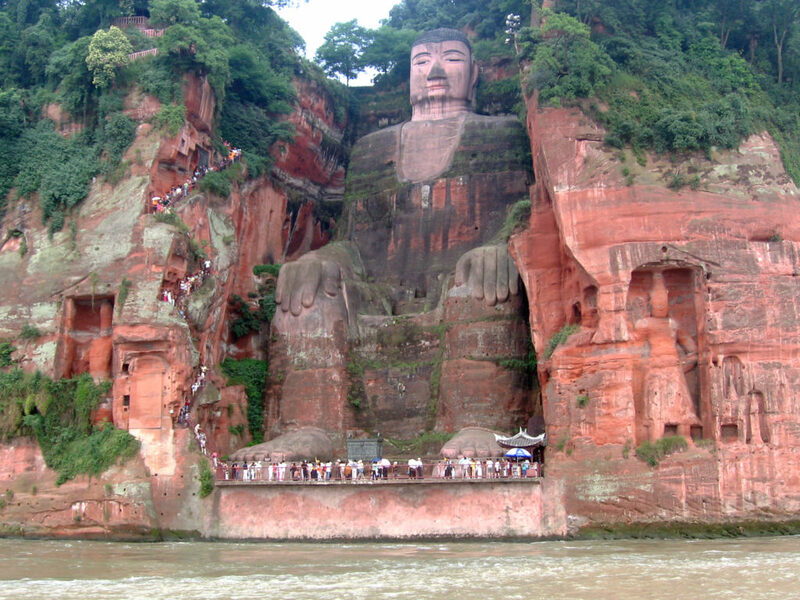 Sandy is right to be worried that all is not what it seems, since the village at the base of the Buddha and the three chambers within the buddha (corresponding to the three energy centers in the body or the 3 dantians) have been over run by Demons who have taken the villagers captive. Its up to the player immortals to rescue the villagers and cleanse the Buddha before continuing on to India. The scenario can be played either as a standalone one off, using Monkey, Pigsy, Sandy and Tripitaka who all have write ups for the scenario, or as a chapter in your own home campaign. Its designed not only to be a rip roaring action scenario but also a gentle induction to some of the concepts of Chinese Religion and Philosophy. Day 9 of 23 Days of Monkey, Monkey 2nd Incarnation Kickstarter opens 8th January 2017. As well as rereading the 1000+ page 4 volume 100 chapter translation of the Journey to the West by Antony Wu published by University of Chicago Press, which is a very complete and detailed version of the novel compared to the large number of abridged versions out there, I also gave my eyes a break by taking in the large number of comics, TV series and Films – most of which I was unaware of when I was writing the first game. Monkey subdues the White Bone Demon. This is an amazing series of wood cuts from 16th Century China, which tells the whole of one chapter, If you want to get the essence of what adventuring in the Journey to the West is like read this. Because the book is in the public domain, 1st edition had lots of scans from the book as its illustrations. Go read Monkey subdues the White Bone Demon on the Internet Archive. 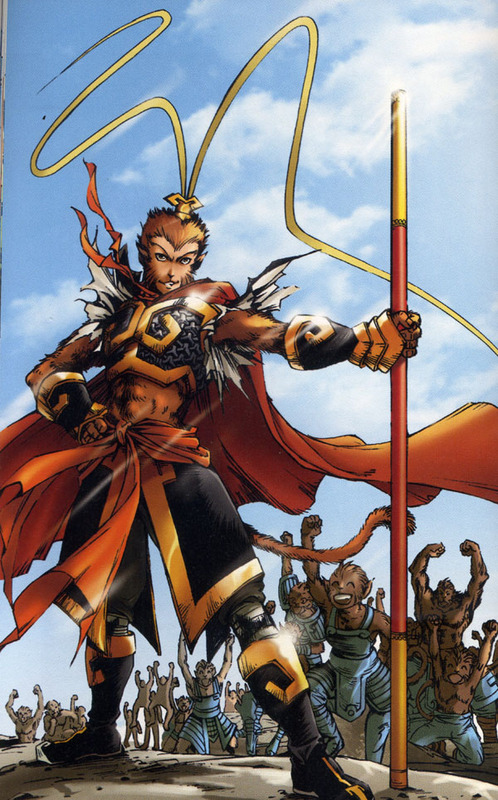 Adventures in China Monkey King by Wei Dong is a 20 issue full colour Manga format comic that has 20 issues. I’ve bought the first four issus from Amazon and they come with a Large poster of one of the featured characters (issue one had the demon hunting Prince Natha for example). Bright colourful and faithful to the story, highly recommended. I have fond memories of the 1970s/1980s Japanese TV series Monkey Magic that was shown here in the UK during the 1980s. It was my first encounter with the Journey to the West. It looks dated now and isn’t the most faithful adaptation of the book, but it retains a great deal of humour amoungst the action. My favorite TV version however is the 1986 Chinese TV version of the Journey to the West whose star Liu Xiao Ling Tong was a member of a family who were members of the Peking Opera who specialized in playing the Monkey King. His elder brother was due to inherit the role from his father, but he died of leukemia so Zhang inherited it and his performance is dedicated to his older brother. The result is breathtaking. Monkey Magic ( 2007) Or Adventures of Super Monkey , is a Japanese Film that follows the same hyper asian humorous format of the 70s/80s Japanese TV series of the same name. It fun and well worth watching. My only nit pick is that Sandy and Pigsy don’t get much time in the spotlight. Stephen Chow of Kung Fu Hustle/Shaolin Soccer did his take on the start of the book with his 2013 film Journey to the West Conquering Demons. Chow is firmly in directing chair, unlike Kung Fu Hustle/Shaolin Soccer which was also the lead actor, but it has the same brightly coloured Road Runner style of his other films. It’s comedic all the way, with occasional glimpses into a more profound themes that he is playing on. 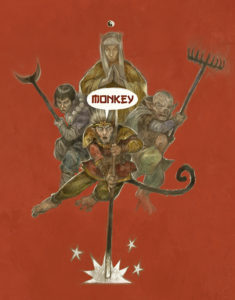 This is Chow’s take on the ‘origin’ story of Monkey and Co and the beginning of the Journey to the West. Instead of focusing on Monkey, the star of the show is Tripitaka the Hairy Monk who sports a large Robert Smith/Side Show Bob hair do and is the demon hunting disciple of a fat Buddhist priest (who suspiciously looks like Bodai, the familiar fat or Laughing Buddha ). This is a major change from the canonical version of the Priest, who in the book is a middle-aged High Priest of the Tang Empire, and one that in context of the film works very well. Without giving too much away Monkey, Sandy and Pigsy are in their Demon forms, and Tripitaka must overcome them. Problem is he’s a young , soft and gentle but with an arrogant streak – obsessed with chasing the Demons as an expression of “Higher Love” and quite frankly incompetent at his job. He’s the comic fool/hero a reversal of his normal role as Straight man to Monkey’s shenanigans. It’s a great retelling of the origin tale, and makes it more dynamic as befits a kung-fu action film, without losing the essence of the reason why Monkey and Co are on their epic quest. It all falls into place by the end of the movie and you are ready to embark on the Journey to the West proper. The sequel is apparently coming in 2017. The Forbidden Kingdom staring Jackie Chan and Jet Li is a tremendous film which features the Monkey King, but is not directly based upon the Journey to the West. Its a very western friendly film with the most of it in English and often has the Chinese Stars smile knowingly into the camera and explain various troupes of Kung Fu films to the audience. I watched this with my 7 year old son (who loves Monkey Magic) recently and he was happily absorbed. In Monkey all the player characters are innately magically because of their immortality. They can all fly and shape-change into human form by default. Every magic power is broad in its scope defined by its name/description but with a critical limitation where the power fails. For example everyone knows that an Immortal they can not carry mortals while flying because they are as heavy as a mountain. Each character has three professions that they draw their skills from, and three of them provide magic. Taoist Sages get to create Paper Talismans to ward of evil, do I-Ching Divination with Yarrow sticks, and practice the art of Feng-Shui. Buddhist Priests use Sutras to drive off evil spirits and demons. Wu Shamans, talk to the dead, call up nature spirits and practice ecstatic dancing. Each player character has a magical weapon or tool. This follows the book; Monkey has his Iron Staff, Pigsy has his Rake, Sandy has necklace of Buddhist pilgrims skulls. Even Tripitaka has his golden headband which Monkey wears and can be made to painfully contract when Tripitaka recites the correct Sutra. 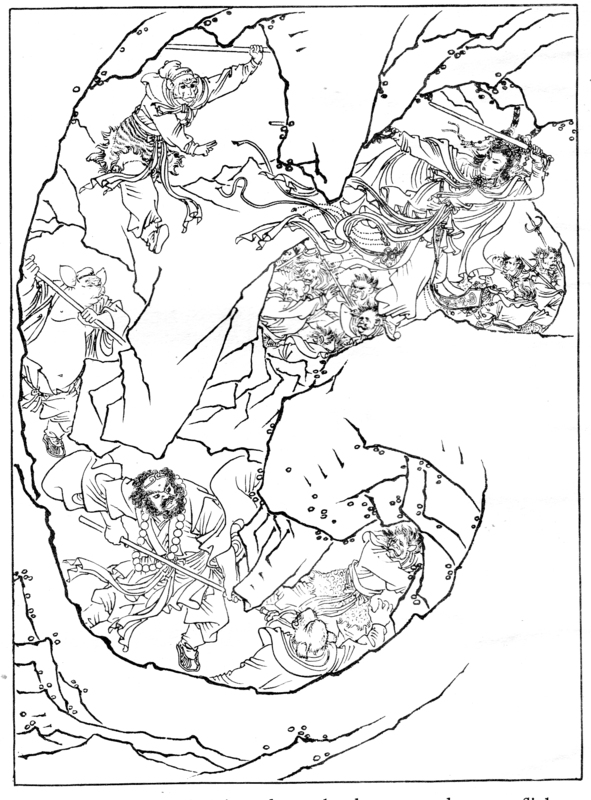 Examples of other magical weapons from Chinese Mythology are given: Such as magic mirrors that reveal disguised demons and fans that send currents of healing air when they are waved. I’ve not overhauled this system of cheerfully improvisational magic in Monkey 2nd Incarnation, but I will be adding rules to help you handle and encourage improvised magic. In the book for example monkey is able to change his hair into a copy of himself. Its not one of his major powers, but it does crop up occasionally. The new version will have more examples from visual research that I’ve done this time round, such as this fight scene between The Jade Warlord and Monkey from the film The Forbidden Kingdom. Day 6 of 23 Days of Monkey, Kickstarter in 17 days on 8th January 2017. Animal Spirits are among the character types available for Player Immortals in the game. 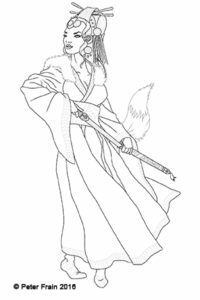 This of course Monkey’s Origin, but also famous are the Fox Spirits, who have a reputation for playful mischief and magical elegance. As well as the narrative aspects of this Origin, Animals Spirits get bonuses from their personality (called Attitudes) since they are more driven by their passions than what they learn in their professions. Meet Whitetails one of the Player Immortals and a Fox Spirit run by Mr C in my home game. He featured in the 1st Edition this is the chacter updated for the 2nd Incarnation. *Whitetails draws two cards for this Dominant Attitudes. I recently came across this film from 2013, The Fox Lover, which is all about a small family of Fox Spirits (or Fox fairies as the translation calls them). More a whimsical and romantic tale than martial arts action blockbuster (although it does have its moments), this tale really shows the sort of personal dilemmas that you can build into a game of Monkey. Day 2 of 23 Days of Monkey, Kickstarter in 21 days on 8th January 2017.